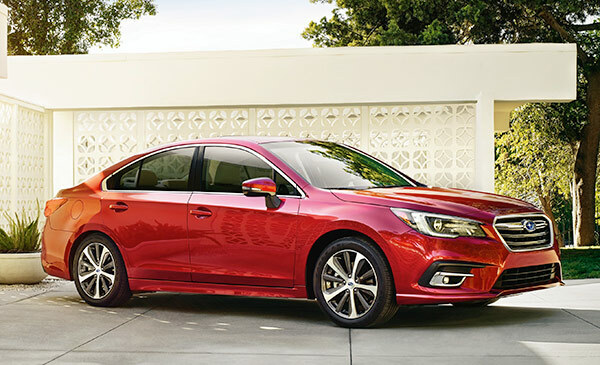 Subaru Legacy received significant upgrades for the 2018 model year. 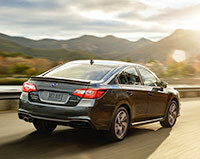 Often overlooked, the 2018 Subaru Legacy is in the fourth year of its sixth generation. When it was all-new for 2015, The Car Connection named it Best Car to Buy. Legacy remains the only midsize sedan with all-wheel drive as standard equipment. Legacy’s styling gets lost in the crowd that includes the Honda Accord and Toyota Camry. Then again, they get lost in the crowd that includes the Legacy. For 2018, Subaru spiffs the styling, with C-shaped headlamps and a new grille, along with a sportier rear fascia. Legacy owners will notice the change, others may not. The cabin materials are higher quality on 2018 Legacy models, with real stitching on most trims. Apple CarPlay and Android Auto become standard equipment. New infotainment capabilities are available. Optional LED headlamps move with the steering. There are also some small engineering and design changes for 2018. The Legacy is as big as a midsize car can be, without it being called full-sized. The government sets 120 cubic feet in the cabin and trunk as the midsize limit, and the Legacy comes in at 119.6, after Subaru added a couple inches of width and 1.6 inches to the wheelbase for this generation. So it’s heavy for a midsize, about 3500 pounds, but the weight doesn’t show. The Legacy Limited uses a 3.6-liter horizontally opposed six-cylinder making 256 horsepower, but it’s not our choice because it’s thirsty and its torque doesn’t match its size. It’s rated by the EPA at 20/28/23 miles per gallon City/Highway/Combined. The four-cylinder 2.5-liter comes in with much better scores: 26/36/30 mpg, thanks partly to active grille shutters that manage airflow and aerodynamics. Considering that it’s four-wheel drive, those high numbers take on more meaning; the AWD four-cylinder Ford Fusion gets 5 less miles per gallon, while the front-wheel-drive Honda Accord and Chevrolet Malibu get 4 less. If you want the maximum fuel mileage from a midsize sedan, there’s the Toyota Camry Hybrid, rated at 43/39/41 miles per gallon. But in snow or ice you’ll want that Subaru. The NHTSA gives the Legacy five stars in crash safety, while the IIHS gives it top scores in every tests, including the notoriously difficult small-overlap frontal test, to earn its coveted Top Safety Pick+ . The IIHS also rated the Legacy’s available forward collision safety systems on the Legacy Superior. Subaru’s EyeSight safety system bundles together active safety equipment including adaptive cruise control, lane-keeping assist, lane-departure warning, and forward collision warning with automatic emergency braking. Blind-spot monitors and rear cross-traffic alerts can be added. For 2018, EyeSight Driver Assist Technology uses the system’s cameras to automatically trigger high beams. Legacy Premium ($24,295) adds a power-adjustable driver’s seat, keyless ignition, an 8.0-inch infotainment system, heated front seats, upgraded six-speaker audio system, leather-wrapped steering wheel, and dual-zone climate control. Options for the Premium trim level include Subaru’s active safety suite, dubbed EyeSight, moonroof, and navigation. The hexagonal grille opening is wider and lower, and the new C-shaped headlamps give the nose some style and maybe elegance that it previously lacked. The headlamps integrate distinctive Konoji daytime LED running lights. A new bumper complements the grille with a wing-like element. Subaru says the headlamps and parking lights and fresh horizontal lines that extend from the grille suggest the piston motion of the horizontally opposed boxer engine. The sheetmetal is conservative and subtle. It’s only daring at the steeply raked windshield and the mildly sculpted fenders and lower bodywork. You can’t see the aluminum hood, but it’s nice to know it’s there, and it saves weight. From the back, the stance looks more planted, although the width is unchanged. A new tailpipe design is integrated into the lower rear fascia. The improved infotainment system, which Subaru calls Starlink, features a new interface on a standard 6.5-inch touchscreen (8.0-inch available), with icons that are easier to read. We’re impressed. The internet radio streaming includes over-the-air updates, and on some models there are cloud-based apps. Starlink enables easy swiping, scrolling, and connectivity to Apple CarPlay. However some icons are hard to find, such as the band in a corner of the audio display. The Legacy is roomy and well appointed, with metallic or wood trim. The instrument panel is clean, the gauges lit in cool blue, the knobs and switches metallic, the vents stacked near the top of the dash. The packaging is good, with big cupholders and a shallow covered bin containing a power outlet and two USB chargers. The console can hold an iPad. The optional leather is excellent, but the bolstering in the seats is maybe only a bit better than average. The Nissan Altima front seats are way better (but not the rears). Legacy beats the Ford Fusion in the rear, where the legroom is a respectable 38.1 inches, same as the Malibu with its three-inch longer wheelbase, but a bit less than the Accord, Camry, and Passat. The Legacy’s rear seat splits 60/40 and folds, something that can’t be said about the base Accord. With the rear seat down, there’s a cutout that expands the trunk’s 15.0 cubic feet. The trunk lid itself is wide and square, making it easy to load big things. Thanks to an acoustic windshield, thicker windows, more insulation in the floor, and liquid-filled engine mounts, the Legacy’s cabin is very quiet, and the visibility is great, thanks to slim roof pillars. Besides Subaru, only Porsche uses the horizontally opposed engine design, and Subaru has been doing it for 50 years. With the cylinders in a horizontal position the engine is more compact, and fits lower in the chassis, for a lower center of gravity and better handing. The disadvantage is fuel consumption, because the package, also called boxer or flat, is a bit more complex than an inline or vee layout. The 2.5-liter flat-four makes 175 horsepower and 174 pound-feet of torque, while the 3.6-liter boxer-six makes 256 hp and 247 lb-ft. The smaller engine gasps for power, and the torque in the bigger engine isn’t fully available at a low rpm range, so it accelerates at a leisurely pace. Our best solution is to go with the 2.5-liter engine and work the paddle shifters of the smooth and tight CVT that feels like a six-speed automatic. But it still takes at least a couple downshift clicks to make the acceleration interesting. Unfortunately, unlike with the Forester or Outback, Subaru doesn’t offer its SI-Drive in the Legacy to punch up the throttle response, a give the CVT eight steps. We like the feel of the electric power steering, which increases its weight as you turn. The Legacy tracks well, drives easy, and unwinds smartly from tight corners. The Legacy remains a whole lot of car for just over $22k. The four-cylinder engine is a better value. Strengths for that price include superb all-wheel drive, fuel mileage, interior room, likeable paddle-shifting CVT, and safety. Acceleration could be better, but we’ll take it for what it is.